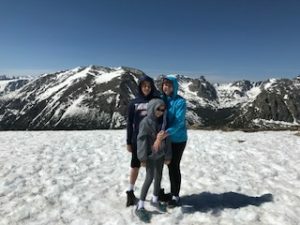 My family recently returned from our first trip to Christian Community Camp in Estes Park, CO.
We didn’t know what to expect, but it proved to be a fantastic experience for my whole family, even my hard-to-please teenage son! 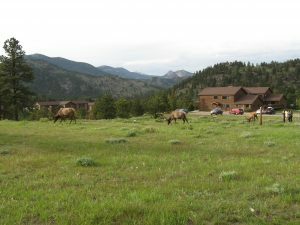 First of all, the lodge where we stay has a 360 degree view of the Rocky mountains with wildlife grazing around the lodge nearly every day. Hikers (and car drivers) could find snow, but the June sunshine kept temperatures mild and comfortable. 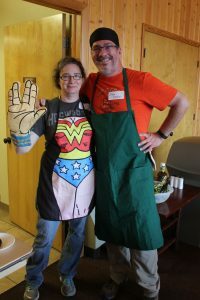 While everyone pitched in to help with the daily chores of meal preparation, serving, and clean-up, Glenn and Tepring Crocker were our lead cooks, and we ate extremely well, three meals a day, all week long. After enjoying extensive periods of free-time for group hikes, horse-back riding, exploring Estes Park’s shopping and dining, creating a one-of-a kind souvenir at the Y – craft shop, or playing at nearby playground, our group came together each night for a reflective Vespers service led by Rev. Monica Lewis followed by a home-cooked supper by the Crocker chefs and a group evening activity. 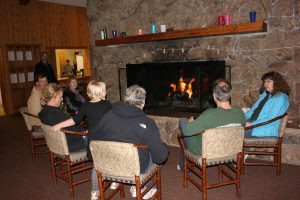 One of my favorite parts of camp was visiting by the fireplace, enjoying the warmth of the fire and the warmth of the friendships that were developing closer each day. If you haven’t come to Community Camp before, consider adding this to your 2018 summer plans. If you have been to Community Camp, but never in June, this is your opportunity to see the beauty of the Rocky Mountains differently than before. We will be returning on June 9-16, 2018. Registration is open for 2018. All are welcome to register so if you have extended family, friends, or neighbors who would like to join us, they are all welcome!